Kuala Lumpur, Malaysia, 3 November 2015 – Where can you find a ballet-inspired Russian artist who created a Magic Carpet, a Mauritanian musician couple who combine the regal tones of the ardine with the contemporary sounds of a modified western guitar, and a Tunisian-French artist who combines graffiti techniques and Arabic calligraphy in street art? 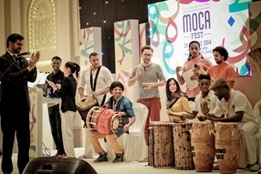 The 8th Marketplace Of Creative Arts festival (MOCAfest) gathers artists from around the world to showcase and celebrate the diversity of Muslim artists with both Muslim and non-Muslim audiences. It is held at the Kuala Lumpur Convention Centre from 3 to 5 November 2015, in conjunction with the 11thWorld Islamic Economic Forum (WIEF). The three-day arts galore is open to all free of charge, in the spirit of the 11thWIEF’s focus on greater collaboration for sustainable growth for economies around the world. Those interested can register at mocafest2015.eventbrite.com. A treat for fans of open-air bazaars, MOCAfest’s very own Souq will run across the three days. The bazaar, held in partnership with Malaysian festival Tempatan Fest, brings together some of the freshest local brands in clothing as well as exotic crafts from countries such as Morocco, Afghanistan and the Philippines. The 8th MOCAfest also introduces Ideapad, where artists and creative entrepreneurs can pitch on stage to investors and funders. The Ideapad reinforces the power and contributions of the creative and cultural arts to our global economy, as well as the recognition that art, culture and creativity inspire economic empowerment and social enterprises among youths worldwide. Another MOCAfest first, Sharing Circle sessions will gather artists, cultural producers and business delegates in fishbowl dialogues to discuss topics such as the development of a creative workforce and social entrepreneurship in the arts sector. The Soundscape Concert, one of the longest-running highlights of the festival, will see international artists come together in the evening on 4 November to present unexpected combinations of different art genres, celebrating diversity and the power of the arts to bring people together. It rounds up the Soundscape Series which runs over the first two days of the festival, featuring short performances around themes such as ‘identity’ and ‘past and present’. This 8th MOCAfest aims to revive richness of the local heritage and promote global collaborations, providing a strong impetus for a vibrant, creative and cultural economy. Of course, no MOCAfest would be complete without the mainstay of workshops, masterclasses, panel discussions, visual arts exhibitions, performances and film screenings. This year is no exception, bringing artists from all over the world for sparks of inspiration and creativity to fly among established and emerging talents worldwide. Faig Ahmed – Artist whose experiments with ancient traditions, cults and cultures results in captivating installations and embroideries. The 8th MOCAfest injects a cultural flavour to the experience of delegates at the 11th WIEF themed ‘Building Resilience for Equitable Growth’, which aims to further facilitate economic development towards sustainable and equitable growth between Muslim and non-Muslim economies.